In the acknowledgements at the back of THE BISHOP’S WIFE the author recounts that she was surprised that Soho, an imprint most closely identified with international crime, chose to publish this novel but that the editor explained “It’s like Mormons are a different country. They speak a different language and you’re the interpreter”. Agreed. Whatever else this book may or may not offer crime fiction aficionados it does provide a fascinating insight into what is, at least for me, an unfamiliar religion. Even before I read the editor’s sentiments I had already remarked to a friend that I was reading a book more foreign to me than all the Swedish crime novels I’ve ever read. The central character and narrator of the novel is Linda Wallheim: mother of five boys, all but one of whom has left home, and wife of the Bishop serving five hundred Mormons in a Utah town. Although bishop’s wife is not an official position Linda, or Sister Wallheim as the community members refer to her, is called upon to help her husband and their flock in all manner of ways. It is therefore not surprising that she becomes involved when the wife of one of the congregation goes missing. Has she left her home – and her small daughter – willingly? Or are her parents right in suspecting Carrie Helm’s husband of foul play? Is there another possible answer? If one of the jobs of literature is to take readers into different worlds then this book is a success. There simply are not a lot of accessible cultural artifacts that depict Mormonism and even less that do so in normative way. I suspect that’s why THE BISHOP’S WIFE feels like it is jammed with exposition and some of it unnecessary – there are passages reminiscent of TV’s CSI in which two scientists explain things to each other in exactly they way they wouldn’t need to in real life but have to because dolts who don’t know anything are watching.- but as one of the dolts who knows next to nothing about this religion I found myself lapping up all the details. That said, I am naturally curious about the goings on within religious communities, if you aren’t equally absorbed by the subject the book might not be for you. As is natural for stories told from the first-person perspective we see events unfolding in Draper the way that Linda Wallheim experiences them. Often she is on the fringes, sometimes because she is picking up the pieces when her husband is undertaking the more official religious duties but also because she is a woman. This sense that Linda might be missing out on things can be a bit annoying as a reader – we know she is cut out of some aspects of community life – but this fact is evened out because her gender also enables her to see and be told things that her husband would not have access to. So we see several threads unfold in addition to the main plot about Carrie’s disappearance and together these form a quite nuanced picture of what life is like for a modern Mormon woman. I’m being a bit vague I suppose because I don’t want to spoil the story for those who choose to read it but THE BISHOP’S WIFE does tackle an important social theme that will resonate with many readers, not only those who’ve spent time in any kind of strict, rule-based community. As crime fiction the book is not traditional: there is only a hint of any professional investigation and even Linda’s amateur efforts do not conform to the tropes of the genre. But the book is compelling in the way it peels back the layers of a world few people would know intimately and there is genuine suspense built up in at least a couple of the threads. In fact Harrison proves herself quite adept at the twisted ending though the resolution is largely devoid of the natural drama more conventional crime novels rely on. 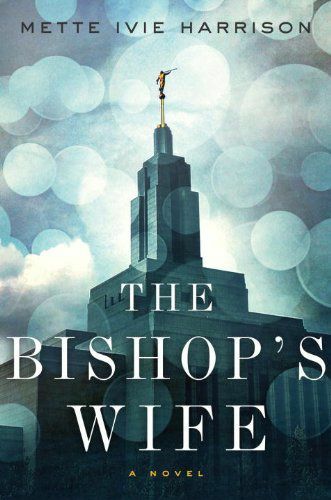 THE BISHOP’S WIFE is more of a slow, thoughtful study than dramatic thriller but I found it curiously captivating. In what is turning into the slowest ever virtual tour of the US (I started in January 2014!) this is only the fifth book I’m counting in my quest to complete the Reading USA Fiction Challenge for which I’ll read books set in each of the USA (and one for the District of Columbia). My personal twist is that all the books are by new (to me) authors. This entry was posted in book review, Mette Ivie Harrison, USA and tagged Reading USA Fiction. Bookmark the permalink. You’ve got me on every level here: I love books about closed communities, about religions, and about Mormonism. I know a little bit about it – my daughter became friendly with a Mormon girl at school, and we got to know the family, and also have visited Utah and loved it. So I think this is a must-read for me. Thanks. I keep hearing good things about this one, Bernadette. I have to say, the context does have me interested. Any book that gives an authentic depiction of, especially, a religious group without either proselytizing or making them ‘the bad guys’ (or curiosity objects) gets my interest. Glad you were drawn in by it. Funnily enough Margot I wondered if I’d heard about the book on your blog – I usually make a note of that kind of thing but didn’t on this occasion so don’t know who to thank for the suggestion if it wasn’t you. Hmmm..That is odd. It wasn’t I, for whatever that’s worth. I read this one last year sometimes and found the insight into the Mormon faith interesting as it’s something I’ve never come across here in Australia. This does sound very interesting. I don’t know much about Mormons and their religion. I appreciate you being vague, I like to know as little as possible going into a book, but I do need some introduction. I need to pick up my progress on the Reading USA Fiction also. Many books I read that are USA based are set in California or New York. But my biggest problem is just remembering to keep track. While this isn’t normally a book I’d gravitate to–I prefer my crime fiction to have more crime in it–I’ve read favourable things about the book and your review rather seals it for me. I’ve put a hold on this one and am looking forward to reading it when it comes in.